The importance of packaging cannot be undermined: it can make or break a product, define brands, create market opportunities and even help solve food wastage. Coming in various sizes, shapes, colours and textures, packaging is a serious business, generating an estimated global market value of US$500 billion, says Angelica Buan in this report. The United Nations Food and Agriculture Organisation (UN-FAO)’s latest global hunger report states that nearly 870 million people were subjected to food scarcity from 2010-2012. Yet, ironically, in the same period also up to 1.3 billion tonnes of food was thrown away, says the agency. This is affirmed by the UK’s Institute of Mechanical Engineers that explains while 4 billion tonnes of food is produced a year, 40% of it goes to waste due to improper harvesting, handling and distribution as well as storage. It is no wonder that a recent campaign by the UN Environmental Programme (UNEP) and FAO has been launched to cut food wastage. Innovating packaging systems will ensure proper food storage, ergo, help curb food wastage. While this may not largely mitigate world hunger, it will, at the very least, make a difference. US-based manufacturer of flexible polymer film structures, shrink bags and barrier laminates Curwoods has innovated the FreshCase leak-proof vacuum-packaging for red meat that maintains the meat’s colour through a found-in-nature proprietary additive in the contact layer of the barrier package. Traditional vacuum-packaged meat is “purple,” deemed distasteful by many consumers who equate colour with freshness. The winner of DuPont’s Diamond Award for Packaging Innovation last year, FreshCase packaging also extends shelf life ten times longer than storewrapped meat. It is an alternative for modified atmosphere (MAP) master packs and packaging using EPS/PVC resin technology that dominate the case-ready meat segment. It is said to enable 75% less waste than store-wrapped meats and reduces packaging materials up to 75%, compared to other case-ready formats. Last year also, Norwegian printed electronics firm ThinFilms Electronics and packaging power house Bemis partnered to develop a flexible sensing platform for the packaging industry. It is able to collect and wirelessly communicate sensor information, for use by the food, consumer product and healthcare sectors. In the packaging sector, it is able to detect spoilage of food. Food handling and the way food is packed or stored while transported also account for the bulk of food wastage. Delicate food items such as eggs are prone to cracking while liquids and powdered items are prone to spillages when improperly packed or transferred. 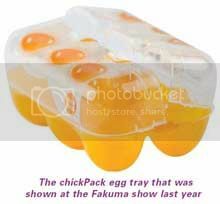 German mould maker SolutionB has developed the chickPack egg trays, an injection moulded PP packaging, which is a two-component part with an average wall thickness of 0.35 mm and weight of 19 g. The new packaging is 50% lighter than its cardboard counterpart, takes up only half of the stack-height space and is tamper proof, the maker said. The packaging was shown at the German show Fakuma by machine maker Ferromatik Milacron, which was producing it on its first F series multi-component machine. 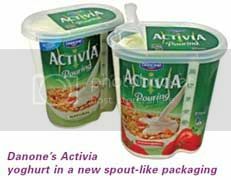 French firm Danone’s Activia yoghurt packaging has had a makeover with the tub made to look more like a jug, with a spout for easy and spill-proof pouring, to stand out in a shelve inundated with other dairy products. Developed by Cryovac Australia and Outerspace Design Group, the injection moulded PP packaging has a side grip dent and a hinged lid with a full body in-mould labelling (IML) wrap. US firm Dow Chemicals is the largest materials supplier to the US$500 billion global packaging sector. Last year alone, its subsidiary Dow Performance Packaging launched 42 new products – introducing nearly one new product per week in the year. Some of the new products include Elite Advanced Technology (AT) PE resins, a proprietary and patent-pending post-metallocene technology built on Dow's Insite technology. The resins are targeted at film converters in the food and speciality packaging and industrial and consumer packaging market segments and are said to enhance resin function in sealant film, stretch wrap film and stretch hood film applications. Properties include optics, stiffness, toughness, processability, and organoleptics for a wide variety of vertical form fill seal and horizontal form fill seal applications. The firm has also expanded its Sealution peel polymers to include Sealution 210, designed for peel seal packaging applications including dry food liners, high clarity lidstock and high clarity lamination films. The ready-to-use, single pellet formulations require no online blending, which may help to reduce errors, defects, and scrap and offers the potential for both time and cost reductions. The seals can help reduce packaging defects such as splitting, tearing, shredding and stringing. Other properties include clarity and transparency, with a potential to be fully recyclable when a 100% polyolefin structure is used, the company stated. Furthermore, the peel strength of packaging remains consistent over time and temperature, even after ageing, said Dow. Emerging markets marked by higher per capita incomes, increased urbanisation and shift in lifestyle and consumer behaviour are also building up the demand for packaging, which was valued at US$329 billion in 2012, according to a market study by UK-based research firm Visiongain. Nevertheless, Visiongain estimates a stagnant growth in developed countries due to saturation in the markets and unfavourable economic conditions. Freedonia Group, meanwhile, presents a buoyant projection for the global food containers market, which is forecast to increase 3.8% a year to US$115 billion in 2013. The largest gains are expected in plastic containers with China forecast to account for 25% of the growth rate between 2008 and 2013. Three key trends are driving food container development: better durability, clarity and food contact safety. 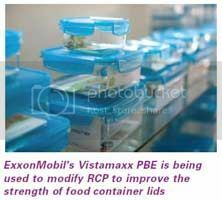 Leveraging on the above, Chinese manufacturer Ningbo Lisi Houseware enhanced the impact strength of its food container lids, which are made from random copolymer polypropylene (RCP), with ExxonMobil Chemical’s Vistamaxx propylene-based elastomer (PBE). Though RCP provides clarity and odour-free advantages, the material lacks impact strength, at low temperatures, and flexibility. Also, when RCP is used for the container lid hinge, stress whitening could be an issue. Hence, the firm found that when RCP is dry blended with 10% Vistamaxx PBE, the impact strength increases within a range from room temperature down to -20°C, with improvement more pronounced at lower temperatures. Sustainability is amongst the criteria for current materials for packaging applications. As such, a new technology has been developed in Finland by the VTT Technical Research Centre that will encourage the food plastic packaging industry to shift toward bio-based plastic packaging. The key to this technique is the sugar-based polyglycolic acid (PGA) polymer. It is said to enable a more efficient production of the monomer glycolic acid from bio-based materials to produce films with oxygen barrier properties that will keep food from spoiling. Adding PGA into the structure of traditional plastic results in a durable and heat-resistant packaging material. It will also enhance the packaging’s ability to be air-tight, vapour-proof and grease-proof. Elsewhere, a new biodegradable thermoplastic for disposable food containers has been developed by scientists from the Agricultural Research Service (ARS), the US Department of Agriculture (USDA)’s scientific research agency, and the Washington State University (WSU). By combining sugar beet pulp (the residue from sugar extraction, which is generated in tonnes annually by processors) with biobased polylactic acid (PLA), using a twinscrew extruder, a composite material is created. It softens when heated, and shows mechanical properties similar to PS and PP compounds that are used to make food containers. Up to 50% of the sugar beet pulp can be melded with PLA. The new thermoplastic is cost-competitive with other commonly used fuel-based plastics.